It's time for drastic changes. With only about a month left into Trusty's five-year life, I decided to finally upgrade my dual-boot Ultrabook. This laptop has been my only serious Linux production machine until very recently, when I purchased the rather sweet Slimbook. From day one, it's only given me good stuff, working reliably and without any issues. A large part of that experience goes to Trusty, the most excellent of operating systems ever made. Now though, it's going away. An upgrade beckons. So let me show you what I did. In fact, it's not going to be one upgrade, but two. We'll go from 14.04 to 18.04 via 16.04. Along the way, I shall entertain you with bits and pieces from this experience, each step of the way. Commence, we must. Unfortunately, there does not seem to be an option to jump two LTS versions, so I had to do an interim upgrade to Xenial first. I decided to run the operation from the command line. After executing the command, nothing much happened for a good few minutes, and I realized the command was stuck. I aborted the attempt and tried again, and this time, it continued just fine, computing the delta needed for the upgrade. be installed. 1865 packages are going to be upgraded. about 6 minutes with your connection. 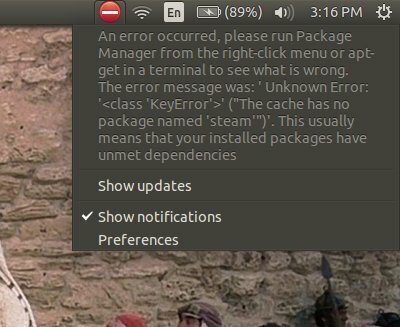 I checked the list of unsupported packages, and this turned to be a long list, but then I will have to see how this impacts me, if at all. Anyway, 650 packages, 1.5 GB. I let the upgrade tool do its magic and whatnot. The upgrade took about 2 hours total, including three or four questions where I had to choose whether to keep an old configuration or rewrite it with a new one. The system was usable throughout the upgrade, albeit a little slow, but the laptop wasn't too hot or anything of that kind. There was a Steam error, but I guess this has to do with the change in the software sources. And then, during the upgrade, I got a prompt to move to 18.04. I decided it would not be wise to attempt an upgrade while running an upgrade, so I chose to postpone this, and do everything gradually: get Xenial running, and if there are no issues there, only then move to Bionic. Then, the GRUB update was ... slow. Not that anything worked slowly, it's just the operation would remove one kernel at a time, update the initramfs, then do it again, and with more than a dozen kernels on the disk, this did take a while. Eventually, the text-driven upgrade completed. I let it try rebooting my machine, but it failed, so I had to it manually. All in all, there were three issues, starting with the stuck command, then there was the Steam error, and finally the reboot thingie. I'm also not sure what the upgrade-within-upgrade would do, but that's for the adventurous of heart among you. Some forty seconds later, I was logged in a Unity desktop, but the underlying system was 16.04. One upgrade complete. I didn't spend too much time tweaking and testing, because I was keen to continue on to the latest LTS, Bionic. Similar procedure. This time, nothing hanged. The upgrade notification offered similar numbers - some packages were no longer officially supported, some were going to be installed, roughly 1.5 GB worth of data needed to be grabbed from the net. And so it begins. The upgrade procedure went smoothly - no errors at all. The time to move to the next OS revision took about the same time as the last time, two hours give or take. A couple of icons vanished from the Launcher, I guess as a consequence of application changes, moving from Unity to Gnome. The reboot worked fine. And thus endeth an era, and began a new age. Right away, I have to say I was missing my Unity setup. The overall look & feel wasn't like before, and there was a noticeable difference in performance and responsiveness - for the worse. But then, as I've shown you last spring, you can run Unity in Bionic. Indeed, this is what we're going to attempt next, but that's a whole new story for another article. The focus here was getting Trusty upgraded, and that's done. I am happy with how the upgrade went, given that I've actually bumped the system two major releases. Apart from small issues, there was nothing cardinal in the move. No data loss, no complications, no crashes. All my stuff remains intact, and so does Windows 8, living happily together and sharing the disk with Ubuntu. Mission accomplished. But we ain't done. I need to make the system as usable as possible. Which means Unity testing - and Plasma testing, of course, duh! Indeed, this remains a productivity box, and as such, it must fulfill some very stringent requirements. It must be stable, fast and elegant. It must work with me every step of the way, and it must allow me to transparently and seamlessly use various programs that I need. On this particular machine, that would be video editing with Kdenlive, that would be image processing with GIMP, the use of encryption and VPN tools, tons of writing on the superbly ergonomic Asus keyboard. But all that and more - coming soon.